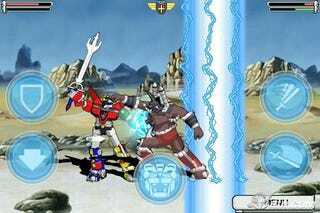 It's a Voltron game! Yeeessssssss. And it's for the iPhone! Hrm. Published by Sony, Voltron: Defender of the Universe will be out later this month, to commemorate the 25th anniversary of the series. It's based on the original Voltron (am I the only person in the world who preferred the one with the vehicles? ), with the kids and the lions, and is a combination of isometric exploration and 2D combat. It's due not only for the iPhone but other mobiles as well, with pricing expected to be between $3 and $10, depending on your carrier/phone. Sounds alright, but we're still waiting on a developer to make the dream Voltron project (see below).